. 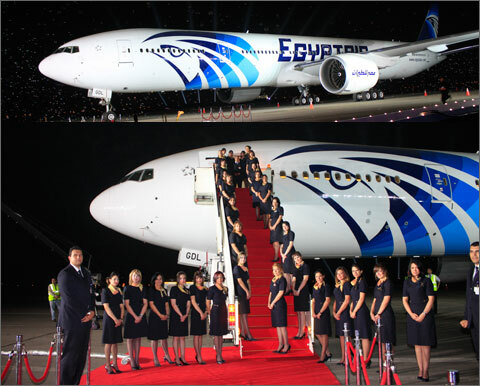 :: EGYPTAIR Celebrates the Delivery of the First B777-300ER ::. Under the auspices of his Excellency Ahmed Shafiq, Minister of Civil aviation, EGYPTAIR celebrated the delivery of the first B777-300ER. Many International and Egyptian celebrities and top figures, representing arts, culture, media, banks, travel and tourism, business and industry, and customers attended the ceremony. The celebration embodied a concrete by the legendry Egyptian composer Omar Khairat, in addition to screening a video displaying the beautiful interior of the aircraft. His Excellency Ahmed Shafiq delivered a short speech to the guests talking about the efforts exerted by EGYPTAIR to modernize the fleet. Moreover, Engineer Hussein Massoud, Chairman and CEO, EGYPTAIR Holding Company addressed the guests about the new aircraft by saying, “This state-of-the-art aircraft is one of the milestones in the course of EGYPTAIR’s strategy to modernize, develop its fleet”. Further, he expressed his happiness with the delivery of this aircraft and its strategic importance for the company. Captain Alaa Ashour, Chairman and CEO, EGYPTAIR Airlines, has also spoken about EGYPTAIR network future expansion plan and he declared that the company is aiming at adding a new destination in North America. Further, Captain Ashour expressed his thanks to EGYPTAIR employees for their support of the current plans adopted by the company. Mr. Carl Brandenburg, Boeing Vice President, has expressed his appreciation to the value of EGYPTAIR and its importance as a strategic partner for Boeing. Moreover, Brandenburg thanked His Excellency, the Minister of Civil Aviation, and Eng. Hussein Massoud for inviting him to this ceremony.